Source: Europe and the United States. Handling Tips: Storage 40° F.
General Information: Deliciously sweet, this orange tends to be less acidic than more commonly available oranges. Its tasty, inviting pulp offers a raspberry undertone and its juice can be quite dark. The color of the blood orange is due to a pigment called anthocyanin, a naturally occurring chemical not usually present in citrus but common in other red fruits and flowers. Blood oranges have been slow to catch on commercially in the United States, perhaps because of their quirky need for cold weather and their unpredictable harvest commencement. The red pigment in this variety of orange does not develop until there has been sufficient cold in the groves, making this a late harvest citrus. Generally available from January – May, the first harvest may be a lighter color of red if the weather has not been sufficiently cold. Blood oranges are an excellent source of vitamin C and dietary fiber. The peel may be used just the same as any other orange for adding flavor to relishes, salads and baked goods with zest. A classic Mediterranean use of this orange is to combine it with sliced fennel in a salad. 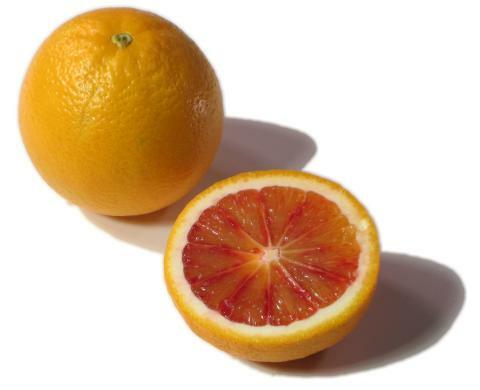 Grown mostly in Mediterranean countries, the Moro blood orange is the most common commercial variety. There are other varieties, including the elongated Tarocco and the egg-shaped Sanguinelli. Each type differs in climate preference, size and flavor. Temperature, amount of light and the variety seem to affect coloration and intensity of blood oranges. It is believed the first mutation of the blood orange occurred in Sicily in the seventeenth century. Easy to peel and medium-size, blood oranges are usually seedless.